How can I show drives as popup button? Open the “Settings (F12) → View → Drives → General” and select the option “Show drives as popup button”. If this setting is checked, a panel’s drive is shown as a popup button between the tool bar and the folder tab bar. Can I show occupied space progress bar (as in Explorer)? In the Settings (F12), select View → Drives → General → and select the option “Show occupied space progress bar”. Note: If this setting and “Show drives as popup button” is checked, the progress bar is shown to the right of the button, incl. 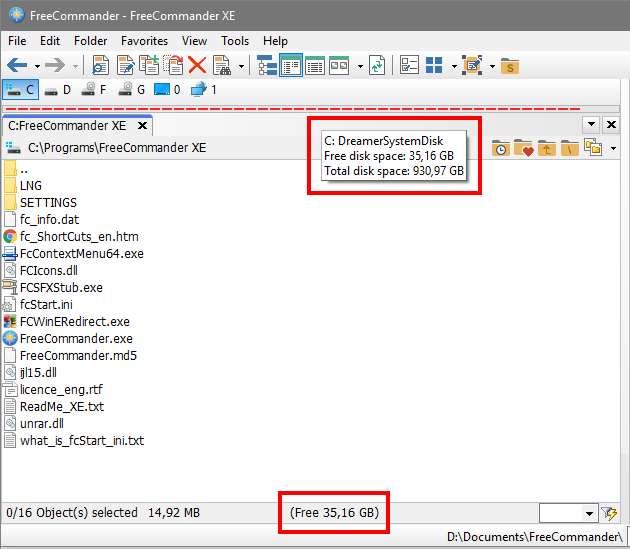 the free disk space. I am using the option “Show drives as button bar”, how can I see the free disk space? Move your mouse cursor over the drive button, or the occupied space progress bar. Note: You can find the free disk space information also in the status bar. Can I hide the toolbar with drives completely? Yes, you can do it, in the Settings window go to “View → Drives → General” and uncheck the options “Show drives as popup button” and “Show drives as button bar”. Can I exclude some drives from the drive bar? To exclude the drives from the drive bar open the Settings (F12), go to View → Drives and type the drive letter(s) into the field under the option “Always exclude drives (e.g. h,m,p)”. Any drives entered in this input field will not be shown in the drive button bar. Example: If “h,m,p” is entered, the (network) drives “H:”, “M:” and “P” will not be shown in the drive button bar. Note: Excluded drive(s) will be still available in “This PC” list and through the quick shortcut (Shift+drive letter). Is it possible to select which folder is opened when the drive is changed? Root folder – When a drive is changed, the drive’s root folder is opened. Example: After clicking “Drive C”, the folder “C:\” is opened. First suitable folder from the history – When a drive is changed, the folder last open on that drive is opened. Same folder like in the other panel – When a drive is changed, the active panel opens to the folder shown in the other panel if it belongs to the clicked drive. Both panels thereby show the same folder.